2 bdrms, 2 bath upper floor, end unit in quiet location at the rear of "The Gables" boasts; spacious open plan, tasteful decor, 2 spacious decks, 2 parking spots incl garage & apron parking & more in desirable complex w/lots of green space. 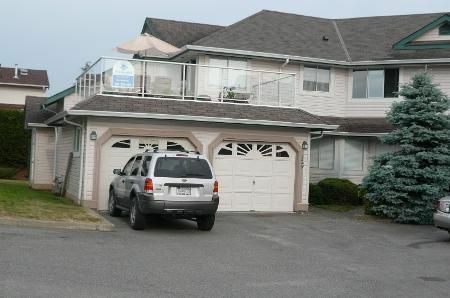 Entertainment sized living rm w/cozy gas f/p & patio dr to spacious rear deck w/view of Mt.Baker. Spacious din rm will accommodate your special occasions & formal dining entertaining. Gourmet kitchen w/scads of oak cabinets, breakfast bar & spacious E/A w/patio dr to huge patio. 2 spacious bdrms incl mbdrm w/his & her closets, 3 pce ensuite & patio dr to spacious rear deck. Second bdrm w/adjoining 4 pce bath. Attractive, tasteful decor, spacious unit w/lots of windows is a must see.